jazmine (who just turned 3 months yesterday) is a very strange little puppy. she won't let you sweep,mop,vaccum, shovel, or clean in any way without going crazy. also i remember this one day when my whole family was out on the back deck (including jazmine) and jazmine woke up from her nap, got up, walked to her crate(which was outside)went inside (which only contained an upside down frisbee) squated over the frisbee and peed into it, not spilling a drop while we watched in wonder. i also remember the day after we got her we were walking around the pond and she jumped in,and she was only 2 months so we were horrified. but she swam right out, shook herself off, and ran towards us looking so proud of herself. 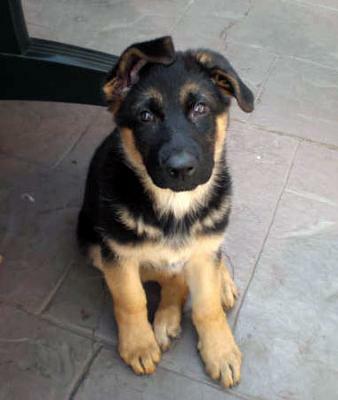 Awww.. GSD puppies are the best! !